The ozone layer is a deep layer in the stratosphere, encircling the Earth, that has large amounts of ozone in it. The layer shields the entire Earth from much of the harmful ultraviolet radiation that comes from the sun. Interestingly, it is also this ultraviolet radiation that forms the ozone in the first place. Ozone is a special form of oxygen, made up of three oxygen atoms rather than the usual two oxygen atoms. It usually forms when some type of radiation or electrical discharge separates the two atoms in an oxygen molecule (O2), which can then individually recombine with other oxygen molecules to form ozone (O3). The ozone layer became more widely appreciated by the public when it was realized that certain chemicals mankind manufactures, called chloroflurocarbons, find their way up into the stratosphere where, through a complex series of chemical reactions, they destroy some of the ozone. As a result of this discovery, an international treaty was signed in 1973 called the Montreal Protocol, and the manufacture of these chemicals was greatly reduced. The ozone layer has since begun to recover somewhat as a result of these efforts, but there is some science which now suggests that the major volcanic eruptions (mainly El Chichon in 1983 and and Mt. Pinatubo in 1991) which have occurred since we started monitoring ozone with satellites in the late 1970's, could have also contributed to the ozone depletion. The amount of stratospheric ozone overhead on any given day and at any given location varies quite a bit. 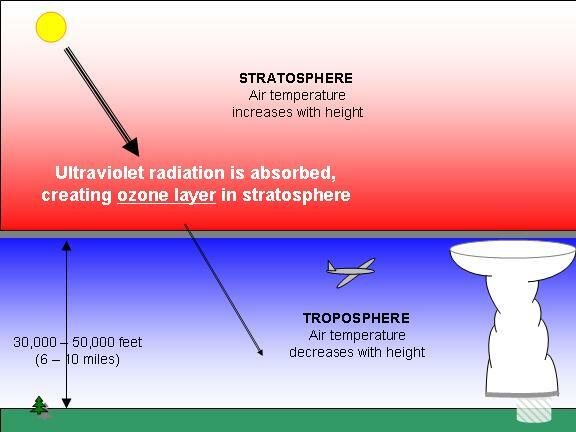 Because of vertical circulations of air in both the troposphere and the stratosphere, there can be greater or lesser amounts of ozone protecting you from ultraviolet radiation. Also, living at higher elevations exposes people to more UV radiation than at low elevations. While stratospheric ozone which protects us from the sun is good, there is also ozone produced near the ground from sunlight interacting with atmospheric pollution in cities that is bad for human health. It causes breathing problems for some people, and usually occurs in the summertime when the pollution over a city builds up during stagnant air conditions associated with high pressure areas.